Mix brewer's yeast and yogurt together to eat less still getting full killing hunger pain softly. Start eating brewer's yeast yogurt today! 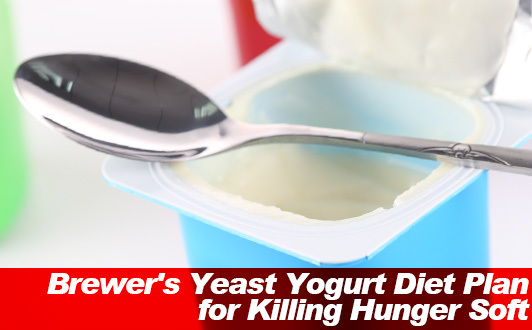 Brewer's yeast mixed with yogurt in your diet may help you kill hunger pains before they start. Combining the health benefits of dietary fiber and good lactic acid bacteria nothing can go wrong when it comes to getting rid of constipation and appetite satisfaction to help you keep on moving. The brewer's yeast yogurt diet is a simple weight loss plan where all you have got to do to lose weight is eat yogurt with brewer's yeast added. When it comes to killing hunger pain, brewer's yeast in your diet gives you the edge you need to prevent overeating. Brewer's yeast expands in your stomach producing a filling effect serving as a natural way to eat less still getting full. It addition to helping you satisfy your appetite eating less, brewer's yeast may help you burn fat faster and get rid of constipation. In the brewer's yeast diet all you have to do is replace a meal yogurt mixed with brewer's yeast. Variations of the brewer's yeast diet include eating brewer's yeast yogurt 30 minutes before eating a meal. For reducing food intake eating less calories, eat brewer's yeast yogurt 30 minutes prior to a meal. If you are in to snacking, don't let anything stop you from exploring food combining recipes. Like the plain yogurt and skim milk diet, brewer's yeast yogurt into the healthy snack that is going to transform the way you go about dieting. Limit the meals you replace with brewer's yeast to one meal a day. Although brewer's yeast is high in nutritional value it doesn't replace balanced eating habits eating a variety of foods. Make adjustments to your diet for nutrition lost replacing a meal with brewer's yeast yogurt. Add 1 Tbsp of brewer's yeast powder 90 grams plain yogurt and mix thoroughly. For making the amount you want to eat when replacing a meal on the brewer's yeast yogurt diet you are going to want to make at least 190 grams of brewer's yeast yogurt. That means 180 grams of yogurt with 2 tablespoons of powdered brewer's yeast. Traditionally, brewer's yeast is used in the manufacturing of beer during the fermentation process. Wort, before yeast is added contains high nutritional value. However, brewer's yeast has many applications outside of beer manufacturing such as in dieting and weight loss for its known health benefits. Brewer's yeast serves as a rich source of vitamins and minerals such as B vitamins, amino acids as well as a good source of protein. The brewer's yeast diet may sound like an impossible diet but it is not. Unlike diets that result in no fat burn not helping you lose weight at all that are ineffective in weight loss, the brewer's yeast diet is not the impossible diet. For health weight loss brewer's yeast is recommending to promote faster burning of fat and carbohydrates, prevent constipation, and keep wrinkles away from your face. B vitamins to unlock enhanced fat burning! Brewer's yeast is a rich source of B vitamins that speed up your metabolism helping your body burn fat and carbs faster. In particular, vitamin B2 also known as the fat burning vitamin is essential for burning fat. Lack of vitamin B2 in your diet adversely affects your ability to burn fat. However, getting vitamin B2 is not enough. Ideally, you want to get a balance of B vitamins to ensure best result. Brewer's yeast is a balanced source of B vitamins that makes it easy to burn fat and carbohydrates. As a fiber rich food, brewer's yeast is hard to top. As you know dietary fiber expands in your stomach soaking up water content. This expansion may result in a state of fullness. That means less risk of overeating. Overeating is the reason why beer makes you fat. Whether you are drinking or not what remains the same is the importance of fiber in your diet to attain fullness as well as promote healthy digestion and smooth bowel movements. To get full eating less getting enough dietary fiber in your diet is a definite must. Yogurt is high in lactic acid bacteria that can help to put your intestinal environment in order curing constipation. Studies show constipation relief on a brewer's yeast and yogurt diet. Combined with fiber rich brewer's yeast you get the best solution to promote healthy bowel movements. The synergy between dietary fiber and lactic acid bacteria is sad to increase good bacteria in your digestive tract. Brewer's yeast increases lactic acid bacteria content in yogurt. By eating yogurt with brewer's yeast added you can appreciate the synergetic effect that you get from brewer's yeast and yogurt in your diet including constipation-free bowel movements and healthier gut flora. A minor setback in the brewer's yeast diet is said to be the taste. If it isn't bitter, then what you are eating may not be real brewer's yeast. That's right, brewer's yeast is bitter. Every drunk diet for women or men starts by making compromises or simply figuring out a solution. After mixing with yogurt, there may be people worrying about its bitterness. In fact there are tons of people who just can get used to it in the beginning. To escape the bitterness off brewer's yeast in your yogurt, adding fruit is the key to making it work. Avoid high calorie sweeteners such as sugar and jam. All other homemade yogurt kits don’t compare to Matsoni yogurt starter making up a healthy batch of diet-friendly Caspian Sea Yogurt for improved lifelong health. Yogurt like other foods with probiotics get better as research drive diet and health to new and more exciting limits. Meiji R-1 Yogurt to boost immunity.